Aditya Utsav is a grand annual cultural and sports festival at Prakash College. This event is held under two categories – Indoors and Outdoors. Students and faculty participate wholeheartedly in this event. This is a window provided to students to showcase their inert and latent talent. This festival at Prakash College has the broadest range of cultural activities to perform and display their hidden talents. It aims at bringing out the creative best in students. This event has a long list of competitions and activities that celebrates the talent and abilities of each and every student. This clearly is the grandest and most awaited event in the college calendar. 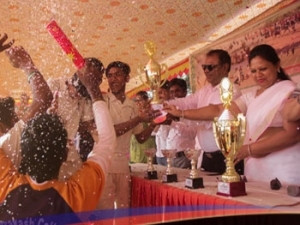 It celebrates, encourages and develops sportsmanship spirit among students and has various forms of sports at Prakash College. This event was begun with the belief that such activities help students be physically and mentally fit. It inculcates a healthy competitive spirit along with a deep understanding of the merits of team work and solo performances.